stumbling upon at least one ancient church or monastery per day. Dilijan National Park – part of the forested northeastern province of Tavush – is no exception to this rule. As well as a prominent and formidable range of Yosemite-esque cliffs running through its northern reaches, and ancient swathes of oriental beech trees blanketing its southern slopes, no fewer than five important cultural-religious historical sites are tucked away in the valleys of the park (as well as countless other little-known ruins). Because of my work with the Transcaucasian Trail, I’ve spent more time exploring this region of Armenia than any other. In this in-depth article, I’ll be giving you the low-down on how to reach all five sites, while at the same time experiencing the beauty of the National Park via a series of fantastic hikes. Thanks to the efforts of the Transcaucasian Trail team, these hikes can also be linked together to create a very cool multi-day adventure in the region. Bonus! 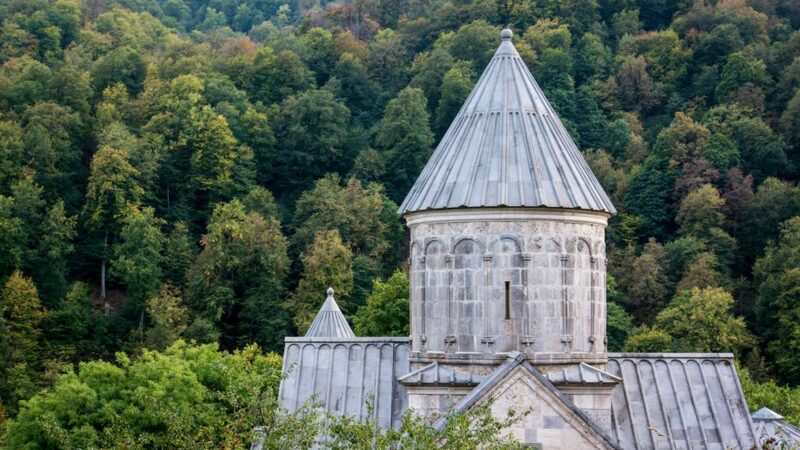 Perhaps the least-visited of the five monasteries, Aghavnavank is reached from the village of the same name, which itself is situated in the depths of the quiet and picturesque Getik valley at the east end of the national park. Continue east on the dirt road from the village centre, cross the bridge and follow the easy, signposted riverside path for about 30 minutes to find this overgrown, characterful and secluded church. The 12th- to 13th-century Holy Mother Of God Hermitage, as the main building is named, has a distinct fairytale-like character, set at the foot of a rock outcrop in a forest clearing, and with ancient (up to 400-year-old) yew groves nearby – hence the name of the trail that leads to the site: the ‘Yew Grove Trail’. Named after Mkhitar Gosh, an Armenian cleric who took part in its building, the 12th-century monastery of Goshavank and the surrounding village of Gosh are easily and quickly reached by road – but it’s way more rewarding, of course, to discover it on foot! If you began your trip at Aghavnavank, it’s a short walk along the Getik valley road to Khachardzan, the next village to the west, and from Khachardzan a 15km hike over the hills to Gosh. You’ll follow the Khachardzan river upstream for an hour or so, then ascend an ancient trail up the steep, rocky mountainside, weaving between cliffs and outcrops, to reach the site of the ruined village now known as Chermakavan and formerly as Aghkilisa. All that remains now of the ‘white church’ (from which the village got its names) are the ruins of a corner wall and an arched doorway, surrounded by part-buried khachkars (cross-stones) – but from this hilltop vantage point, you can easy see why the village’s former inhabitants chose to settle on these expansive, gradually sloping meadows. As you continue to walk, a little inquisitiveness will reveal the walls and foundations of old stone houses nestled among the orchards of apples and pears. Descending through the forest, you’ll skirt the edge of Gosh Lake before traversing forests and hayfields and descending into the village of Gosh, bringing you out opposite the famous monastery complex. If you’ve timed your arrival right, the last of the tour groups will be leaving and you’ll find the complex bathed in the warm glow of sunset. The founding of Goshavank began in 1188, before it got its current name and before any of the present-day structures were built. It was built to replace another monastery in the region, Getik Vank, which had been destroyed by an earthquake – the reason it was referred to as ‘Nor Getik’, meaning New Getik. When Mkhitar Gosh died in 1213, the monastery was renamed in his memory. Today there’s plentiful information on display about the complex, which like so many well-known monasteries in Armenia is undergoing a slow process of renovation and rebuilding. From Goshavank, most visitors head back to Dilijan by road – but my advice is to stay overnight, either in the Mkhitar Gosh Hotel* or by camping just behind the monastery (which the locals usually tolerate if you ask nicely), and to spend the following full day hiking the gorgeous 21km forested trail to Dilijan (via Parz Lake) – before rewarding yourself with a hearty dinner at Kchuch. The monastery-hunting adventure continues at the northwestern end of Dilijan. Take a local bus or taxi (or simply walk) up Abovyan Street, passing beneath an enormous railway viaduct and through a narrowing wooded valley. You’ll come to an information board with details of the ‘Trail of Medieval Monasteries’ – which you’ll be following to discover not just Matosavank but the next of the monasteries in my list as well. From the information board, head down the rough track to the river. There’s a footbridge a few metres upstream from the ford, and a freshwater spring from where you can fill up your water bottles. Head uphill on the jeep track, making sure not to miss the signposted footpath which goes off to the left as you round the first bend. Follow the trail markers as the route weaves up the wooded hillside – it should take you no more than 30 minutes to reach the monastery, which seems to emerge from the earth like a slumbering stone beast. Perhaps by virtue of being partly ruined, Matosavank – named after Saint Matthew – is a monastery that really expresses its age. It was completed in 1247 under the supervision of Avag Zakarian–Mkhargrdzeli, a Georgian governor and military commander of Armenian descent whose house had recently submitted to Mongol rule. At that time, Armenia was part of the Kingdom of Georgia, which had been gradually decimated by repeated Mongol invasions since 1220. Avag himself may never have enjoyed the finished monastery: he died in 1250, 3 years after its completion. The building itself has a cruciform floorplan, and for fans of khachkars there are a great many fine examples inside. A helpful information board on the approach to the monastery gives you more details of the layout, including what each of the several rooms were used for. If you’re there in springtime you’ll find the forest floor around Matosavank speckled with shade-loving wildflowers, including cowslips, violets and blue anemones. ‘Jukht’ is an Armenian word for ‘pair’ or ‘couple’, and the epithet is true: Jukhtakvank consists of two similarly squat, square churches on the opposite side of the valley to Matosavank. To find them, continue following the ‘Trail of Medieval Monasteries’ north through the woods until you reach an established jeep track. This will take you back down to the river, where you’ll cross a metal footbridge and follow another jeep track up and through the woods, bringing you out just below the two churches. This section of your hike should take about 30 minutes. Turn left and uphill at the signpost and continue round the corner: the first church will emerge from behind the trees on the left. Its name roughly translating as ‘soaring eagle’, the 10th–13th-century monastery complex of Haghartsin is nowadays one of Dilijan National Park’s most frequently-visited tourist attractions, with tour groups coming and going all day via a nice smooth asphalt road. How, then, to best appreciate this cluster of historical buildings set in a tranquil cleft in a forested valley? By hiking there, of course – and arriving either before the first groups have arrived, or after they’ve left! The most spectacular routes begin either from Hovk (26km) or Jukhtakvank (20km, see above). Both will require a full day of tough hiking in the mountains – but it’s worth it to emerge at the quiet complex in the early evening and explore unmolested. If you’ve been wise enough to bring your own camping gear, you’ll be pleased to hear that the monks usually allow informal camping behind the main church. With a freshwater spring and a WC nearby, it’s one of the best hidden camping opportunities I know of in the park. Haghartsin monastery complex might initially surprise you with its fresh and new appearance. It was in fact extensively renovated in 2011 thanks to a donation from the ruler of Sharjah, who was apparently so spellbound upon visiting the site that he pledged a huge sum to have it fully restored. Upon entering the churches, however, you’ll find the interiors look much more their true age. An inscription was unearthed in the 1950s that gave an original date of 1071 for the building of the bigger Mother of God church, though most information sources give a date of 1281; and the church of St Gregory is thought to be older still, though nobody quite knows when. Something of an air of mystery thus surrounds the question of when and what was built and renovated. Right now I’m helping crowdfund the first ever detailed hiking map of Dilijan National Park. The ultra-detailed 1:25,000-scale folding sheet map will highlight all the hiking routes and cultural-historical sites above, as well as the rest of the park’s trail network. Please take a minute to watch the video above, and if you like what you see, click here to pledge your support and pre-order your copy of the finished map. Thank you!